You don’t have the time, operating expense, or capital to risk your well. You need a pumping unit that is reliable and achieves maximum production. 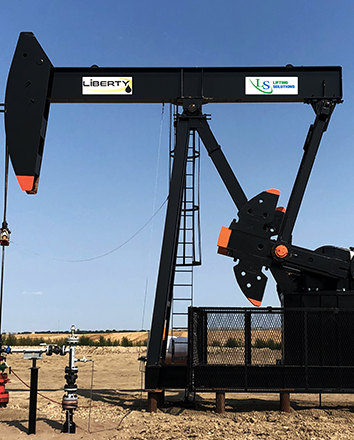 With over 2,000 units in operation, Lifting Solutions is proud to announce our strategic pumping unit partnership with Liberty Lift. The double-reduction, double-helical, involute tooth gearing is manufactured to precision utilizing the hobbing process for dimensional integrity, quiet operation, and reliability— the HE pumping unit has never experienced a gearbox failure. All gearbox testing data exceeds API specifications, standardizing overloaded operation (gearbox loading) on initial production. At the manufacturing ground level, engineers and metallurgists monitor and ensure all components are manufactured to exact specification.